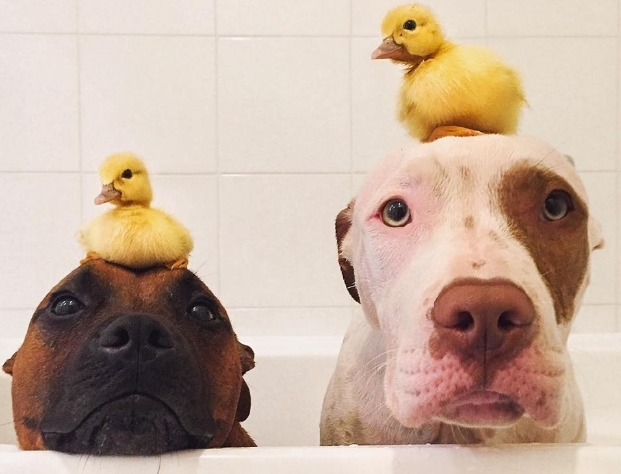 For the longest time, all Pikelet And Patty Cakes wanted ... were ducks. That's right, ducks. While the two brothers loved each other dearly, what they really wanted were tiny duck siblings to nurture and play with for the rest of their days. It seemed like an impossible dream ... until one day, it came true. Patty Cakes and Pikelet's parents decided to foster two little ducklings rescued by Wollongong Animal Rescue Network, and the brothers literally could not have been more excited about it. The little ducks are named Penguin and Popinjay, and they love their new dog brothers right back. All the brothers had ever wanted were ducklings, but now that they have them, they're almost not sure what to do with them. The ducks are so tiny and need major protecting, and so that's what the brothers do — protect them. The brothers are rendered practically motionless while playing with their ducklings, probably because they don't want to accidentally hurt the little guys. After all, they're VERY tiny. All in all though, the ducklings seem to be everything the brothers have ever dreamed about, and I'm sure they will be pretty heartbroken when the ducks finally have to go off to their new forever home. Responses to "Dog Brothers Can't Get Enough Of Their New Duckling Siblings"